Sometimes when you're driving, you hit potholes, large bumps in the road, or other obstacles that can knock a wheel askew. As a result, your car might consistently pull to one side and you might feel a slight vibration in your steering wheel as you're going straight. Also, your tires could wear out unevenly, causing you to have to replace them earlier than you thought you would. 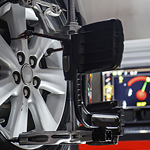 Service technicians can perform alignment inspections to make sure things are in the right orientation. This is a good idea to do on a regular basis, such as whenever you get your oil changed. If you'd like to schedule an appointment at Grand Blanc Motorcars, LTD, please give us a call. Are You Ready to Buy a New Vehicle?